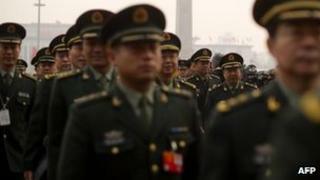 China's cyber warfare skills could pose a threat to the United States military in a conflict, said a report. The report was released by a congressional panel, the US-China Economic and Security Review Commission. It said China's military had focused increasingly on "information confrontation". It also highlighted China's development of cyber tools and links to large telecommunications firms. The136-page report, prepared for the US Congress by defence contractor Northrop Grumman, said that Chinese commercial firms - some with foreign partners - were providing the People's Liberation Army (PLA) with advanced technology and research. The PLA had ''embraced the idea that successful war-fighting is based on the ability to exert control over an adversary's information and information systems", the report said. Using the scenario of a US defence of Taiwan as an example, the report said that China could hit US systems with "electronic countermeasures weapons and network attack and exploitation tools''. The report also warned that the difficulty in identifying the party behind any cyber attack could delay the US response. "Computer network operations (attack, defence and exploitation) have become fundamental to the PLA's strategic campaign goals for seizing information dominance early and using it to enable and support other PLA operations throughout a conflict," it concluded. This report was a follow-up to a previous report that Northrop Grumman completed for the commission in 2009. That report had warned that China was possibly carrying out ''a long-term, sophisticated, computer network exploitation campaign" against the US. The US-China Economic and Security Review Commission, created in 2000, is tasked with reporting on the national security implications of trade ties with China.